Dentists around the country have united to raise awareness about gum disease, a condition that affects over 50% of American adults. Thus, the month of February has been designated as National Gum Disease Awareness Month, a time set aside to emphasize the importance of preventive care and gum disease treatment in Fort Worth. As you read on, you’ll learn about the other issues that can be prevented by taking a more proactive approach to your oral health. To understand gum disease, we must first start with bacteria. These microorganisms are always present in the mouth, but when food and beverages other than water are consumed, they feed on any leftover particles. If not addressed, hundreds of different types of bacteria can collect and form plaque, a sticky substance that clings to the teeth and along the gum line. Over time, it can seep beneath the gums, and it can form germ pockets, which is one of the early stages of gum disease – called gingivitis. It’s critical to your oral health to not ignore gum disease. As the bacteria are allowed to continue moving, they can permanently damage the ligaments and bone that hold your teeth in place, and they can dissolve the roots, all of which can lead to your teeth falling out. The issues don’t stop there, though. 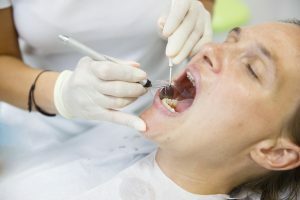 Recent studies show a connection between gum disease and life-threatening health conditions like oral cancer, Alzheimer’s disease, heart disease and stroke. The common denominator among them is the presence of hundreds of oral bacteria. Then, the resulting plaque can cause harmful inflammation that causes the deterioration of vital tissues throughout the body. Another issue with increased inflammation is the negative effect it has on the immune system. Failing to treat gum disease, then, can leave you vulnerable to a host of infections. One of the most common ways of addressing gum disease is the scaling and root planing procedure. It consists of your dentist removing bacteria beneath the gums and then smoothing the roots of the affected teeth to prevent any new bacteria growth. While your dentist can provide the necessary treatment to recover from gum disease, the best form of care is preventive. Thus, you should be sure to visit your dentist every six months for cleanings and examinations. It’s equally vital to brush and floss your teeth on a consistent, twice-daily schedule. You don’t have to settle for having poor gum or overall health. So to get on the path to recovery and prevention, contact your dentist in Fort Worth to schedule a visit today. Dr. David Tillman earned his dental degree from the University of Texas Dental Branch in Houston. He has since gone on the provide compassionate and comprehensive care for over 20 years. A life-long learner, Dr. Tillman has taken over 2,500 hours of continuing education, which allows him to stay abreast of the latest advancements in the world of dentistry. He treats gum disease at his private practice, and he can be reached for more information through his website.